Bristal, an orphaned kitchen maid, lands in a gritty fairy tale gone wrong when she discovers she is an elicromancer with a knack for shape-shifting. An ancient breed of immortal magic beings, elicromancers have been winnowed down to merely two - now three - after centuries of bloody conflict in the realm. Their gifts are fraught with responsibility, and sixteen-year-old Bristal is torn between two paths. Should she vow to seek the good of the world, to protect and serve mortals? Or should she follow the strength of her power, even if it leads to unknown terrors? She draws on her ability to disguise herself as a man to infiltrate a prince's band of soldiers, and masquerades as a fairy godmother to shield a cursed princess, but time is running out. As an army of dark creatures grows closer, Bristal faces a supernatural war. To save the kingdoms, Bristal must find the courage to show her true form. Fun fact: I LOVE fairytale retellings! I participate in a retelling challenge every year and actively seek them out because they're usually amazing. When I first saw Kingdom of Ash and Briars earlier this year I knew I had to have it and, when I had the opportunity to read an ARC, of course I said yes! With such an amazing lineup of tales, I expected nothing short of greatness! 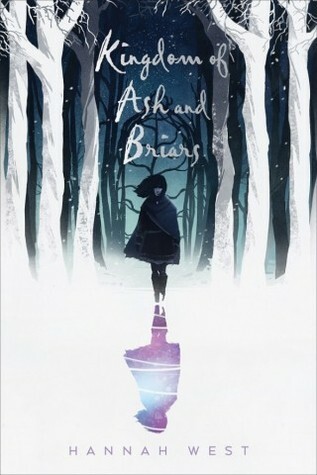 Kingdom of Ash and Briars is about Bristal, a kitchen maid who is literally dragged to her magical fate as an elicromancer. The first page of this book throws the reader directly into the action along with Bristal so we really don't learn anything about her or what's going on. We also learn about the magical aspects and lore of her world as she navigates her story. Although I wasn't able to connect with Bristal very much, I did enjoy her for the most part. The way she was written did make her seem really interesting, but also distant. There were other characters in the story who were important, but equally as difficult to connect with. Unfortunately I put this book down at 55% so I didn't get very far into the Bristal's romance, so I can't really say much about that. Instead I'd like to comment on the romance between Rosamund and her prince. Look, I understand that this is supposed to be the Sleeping Beauty part of the story but I honestly wanted to throw up when I read that he loved her and would do anything for her after knowing her for maybe a couple hours. Yes, the Disney version was very instalovey, but come on. This is a retelling. Why can't it be, you know, retold? I have no idea if the Cinderella part of the book was as bad in the romance department because I only saw the very beginning of it. Which brings me to the story. This is marketed as a fairytale retelling and it is certainly a fairytale mashup but I'm not sure if "retelling" is the appropriate word. Usually (and maybe I've just happened upon this type of book thus far) a retelling uses aspects of a well-known story and makes into something almost entirely new. This is the first time I've seen so many fairytales basically smashed together with a couple details tweaked and they are literally just one after another. Kingdom of Ash and Briars had the potential to be amazing! Bristal's story apart from all of the other fairytales could have been fantastic on its own. I was really interested in everything she had to do to basically try to save the world from a crazy person, but it got really bogged down for me on the way there and I just couldn't keep going. And this is coming from someone who loves fairytale retellings! The magic had the potential to be an amazing aspect of the story but was never quite expanded upon enough to really make sense. I wanted to love this so much and I really hate not enjoying a book, especially when it was given to me for review, but I just couldn't finish this. I tried off and on for nearly a month before just calling it quits and passing it on to another blogger. Luckily for all of you, I seem to be in the minority on this one! Retellings remain my favorite thing to read. Unfortunately, this just wasn't the one for me.